Earn up to 4,104 reward points. Nine harmonicas with great tone and feel. Harmonica set - 9 SESSION STEEL harmonicas and a free T-shirt, as well as a soft case that can hold up to 14 harmonicas. 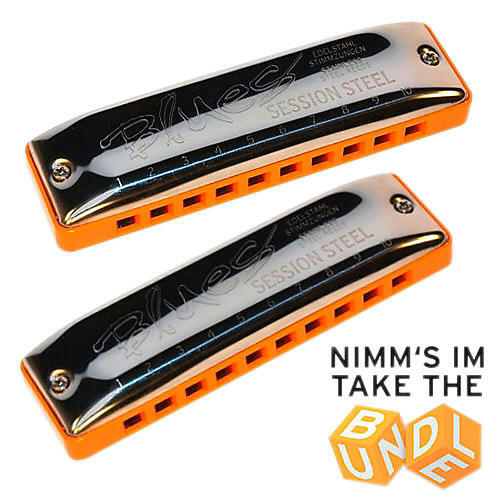 SESSION STEEL harmonicas are a 10-hole diatonics with rugged plastic combs and quality-built reeds. They are comfortable to hold, tune perfectly and last longer than conventional harmonicas. This set ships with the seven most commonly used harmonica keys: LD, LF, G, A, Bb, C, D, Eb, F.
The SESSION STEEL is the upgrade to Seydel's successful SESSION mode. It is presented with a bold new look and superior technical reliability, excellent playability and a fantastic sound. The ergonomic coverplates are made of stainless steel, and are completely rounded at the mouthpiece. Features include ABS comb with recessed German Silver reedplates, stainless steel rivets and screws, and lip and beard-friendly design. Order today and be armed to the teeth.